Reduces risk of accidental contact by visitors. Place a zip tie strap through one hole at top of sign. 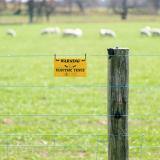 Attach around fence wire and pull on zip strap to secure one end of warning sign to wire. 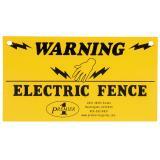 Make sure the fence (energizer) is turned off before installing. Number of reviews: 13 customers reviewed this product. Recommended: 10 out of 13 said they would recommend this product to a friend. Great quality product. 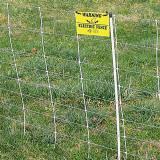 Looks great on my fencing from Premier1 too. 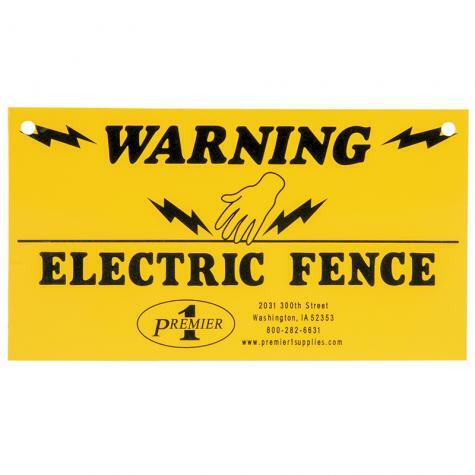 I use this on our fences because we have family and guests that come by to look at the horses and this warns them that "don't touch the fence" may be on. 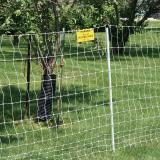 This is easy to attach to the fencing. Great product. Have been looking for something like this to add to our hobby farm products. Thank you Premier1! I mark every other panel on my Perma Netting Plus. I really like these signs, more so than the one that comes with the fencing. I've had them on 2 sections of fence for about 6 months now and they hold up really well. It seems like they have an extra piece of plastic on them, not sure if I'm supposed to remove that or not. I never have or tried to and the signs I've had hanging it hasn't peeled. Very Pleased with these. I only gave four stars because of the crappy zip ties. In the sign kits I received with my order this week, when I was securing them seems like every fourth zip tie would snap before even cinching down. I'm glad I put a bag of zip ties in my pocket before I started putting the fencing up. I would of been really ticked if I hadn't had the extra zip ties and had to go get some to finish the job. So note that would be something you would want to get and have on hand before setting out. I already had the zip ties because I zip tie my end posts together where they meet and had just moved my entry gate which I also zip tie to the end posts. Perhaps its just a quality control issue with the supplier of the zip ties. But Premier 1 should look into it. Temps were in the 40s and I had the sign kits in my pants pocket so I don't think it was a temperature issue. The plastic in the zip ties that snapped were brittle not soft and pliable. Hate cheap zip ties its a pet peeve. Signs are simple and effective! I buy all my fencing materials from premier fencing.Can't beat price, quality and service.